Should we head for the light or keep away from it? 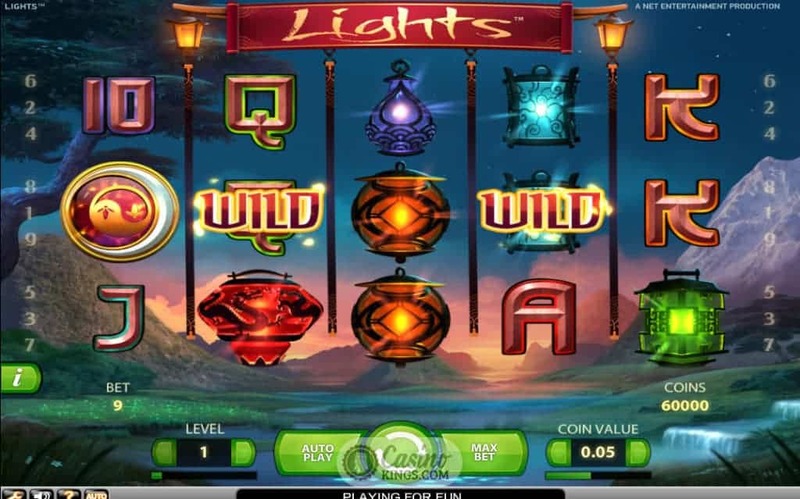 This may be a difficult question when it comes to near death experiences, but when it comes to the Lights Slot game this five reel, 9 payline beauty from Net Entertainment, we should definitely aim for the Lights. As a wise man once said, aim for the Lights and the reels will look after themselves. 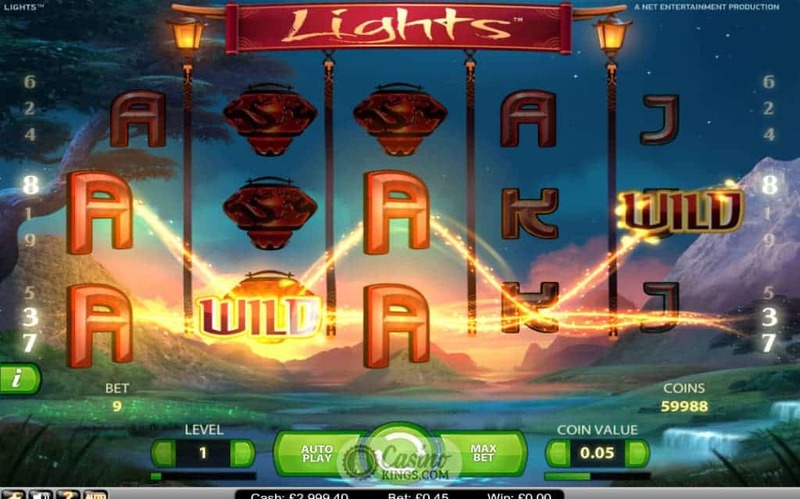 NetEnt loves online slots with strong themes, and Lights is no exception. 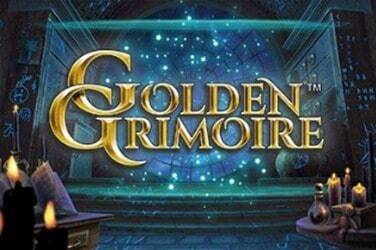 While the title may be slightly ambiguous, as soon as the game launches the theme is clear. An uplifting and mystical sound score greets us as we gaze upon a mountain range at sunset, stars twinkling and waterfall running free. 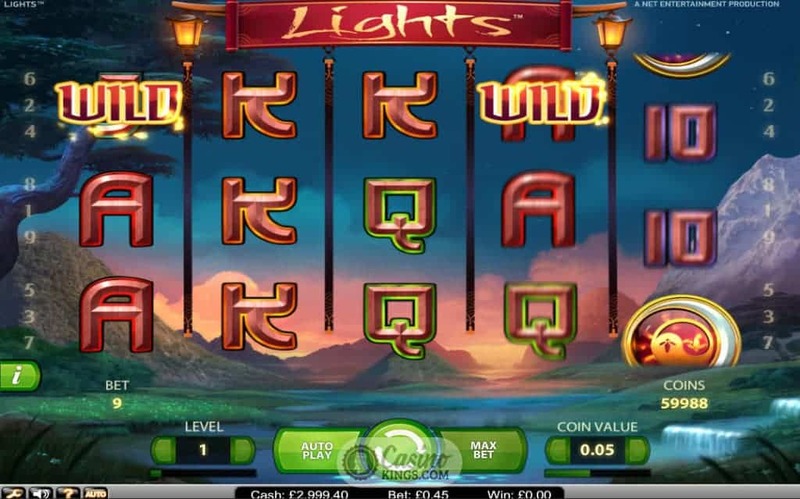 The lights in question are five Chinese lanterns of various colours that form our high symbols, while our low symbols are Oriental-styled 10s through Aces. 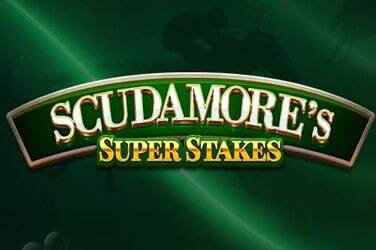 While 9 paylines may seem on the low side for any modern slots fan, the number 9 is a lucky number in Chinese culture so is a thematically sound choice. Aside from those auspicious reasons, the base game includes a set of fireflies that flit across the five reels as the reels spin, landing on the reels and forming between two and four randomly appearing Wilds for every single spin. Having these random Wilds in play for every spin ensures that each spin has decent potential of creating winning combinations, and we have decent potential for achieving the kind of bright lights we are aiming for. 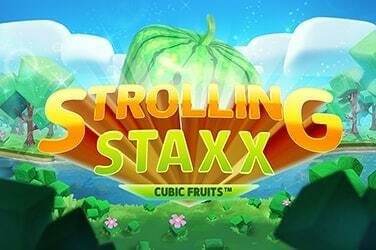 NetEnt does sometimes like to keep bonuses in the base game rather than have any dedicated bonus features, but the Cosmopolitan outfit also likes to mix it up and so Lights does have its own Free Spins bonus round. 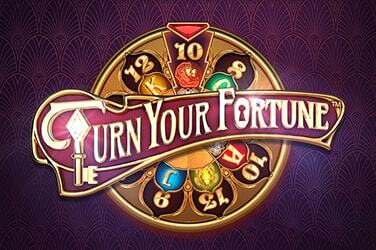 Landing three or more Yin and Yang Scatter symbols triggers the bonus feature, with three Scatters scoring 10 free spins, four Scatters bagging us 20 free spins and 30 free spins for landing all five Scatters across the reels. Not only do we love free spins, but the alluring fireflies are back in the bonus feature and this time they’ve brought their friends along. Now we have between three and six random firefly Wilds accompanying every single spin, which can see the whole set of reels turn Wild and prove Big Wins can come to those who Zen. 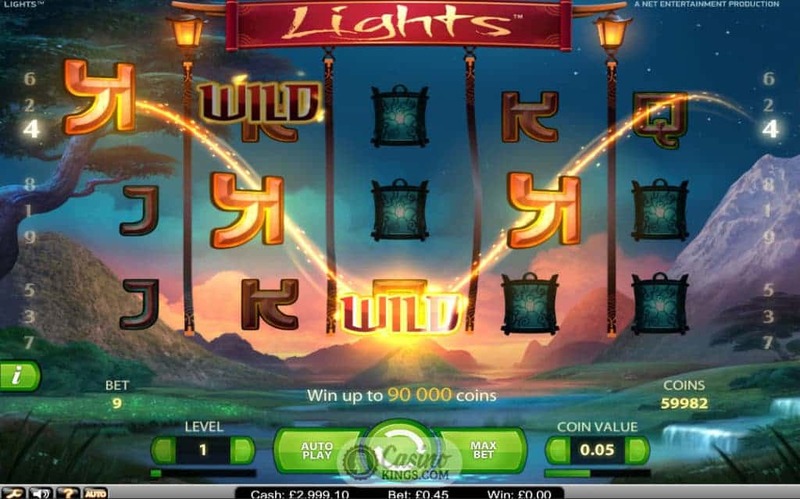 As far-Eastern themed online slots go, Lights is one of the best. The firefly animations bring the base game to life, while the sound score is Zen-like in its ability to relax and inspire in equal measure. The constantly-shifting random Wilds keep the base game fresh like a dip in Basum Lake, while they also ensure the bonus game has plenty to offer.